From a social perspective, the word chaperone refers to a matron who used to accompany young people in public, especially ladies, and supervise them at a social gathering to ensure proper behavior. Similarly, those proteins that assist others in their proper folding and biological functions are also referred to as chaperones. During the late ‘70s, it was coined the term ‘molecular chaperones’ to make reference to the ability of nucleoplasmin to prevent the aggregation of histones with DNA during the assembly of nucleosomes. As a consequence, this nomenclature was extended to all proteins able to mediate the post-translational assembly of protein complexes. Although the primary concept of molecular chaperone was related to its ability to ensure the correct folding of newly synthesized peptides and refolding of stress-denatured proteins, it should be noted that chaperones are also involved in essential and more sophisticated functions such as promoting the correct assembly of oligomeric complexes. One of the most remarkable examples for this special feature is the ability of a particular subfamily of molecular chaperones, the heat-shock proteins, to assist the proper assembly of steroid receptors with chaperones and co-chaperones. This important feature permits the binding of steroids to activate isoform of the receptor, which functions as a ligand-dependent transcription factor. The term ‘heat-shock protein’ stems from the original observation that heat-stress greatly enhances the production of this particular class of molecular chaperones. This means that all heat-shock proteins are molecular chaperones, but not all molecular chaperones are necessarily heat-shock proteins. Temperature is not the only stimulus able to induce heat-shock proteins. Upon the onset of several environmental types of stress or due to the exposure to damaging and extreme insults, the cells increase dramatically the production of molecular chaperones, which play prominent roles in many of the most basic cellular processes by stabilizing unfolded or misfolded peptides, giving the cell time to repair or re-synthesize damaged proteins. In addition to commanding the proper folding of a factor exposed to an environmental injury, many chaperones are also related to other key functions such as enzyme activity, cytoskeletal architecture, nuclear organization, protein trafficking, transcriptional regulation, epigenetic alterations of gene expression and, even more intriguingly, heritable alterations in chromatin state. The biological relevance of molecular chaperones during the modern times was discovered during the early 1960s when the Italian scientist Ferruccio Ritossa was studying nucleic acid synthesis in puffs of Drosophila salivary glands. A colleague accidentally changed the temperature of the cell incubator and an incredible transcriptional activity of new chromosomal puffs was evidenced. The induction of these proteins is one of the most important manifestations of environmentally induced changes in gene expression. The whole proteome of the cell is successfully maintained thanks to the assistance of molecular chaperones. In addition, the subcellular localization, local concentration, and biological activity of each protein must be strictly regulated in response to both intrinsic and environmental stimuli. The recently coined portmanteau word proteostasis describes this equilibrated state of the healthy proteome balance, whereas the term proteostasis network refers to the group of cellular events and factors involved in proteostasis maintenance. Failures of proteostasis regulation are responsible for a number of diseases as well as for the deleterious consequences of physiologic processes such as ageing. Since molecular chaperones play a key role in the maintenance of this proteostasis network, they became potential pharmacological targets to preserve that proteostatic function and to improve the biology of the cells by enhancing certain activities (or preventing others). In this regard, several endeavors are currently focused in targeting Hsp90 and some of its cochaperones such as high molecular weight immunophilins and p23. Currently, this is being tested as an exciting alternative for molecular-based therapies, particularly in both malignant and neurodegenerative diseases. 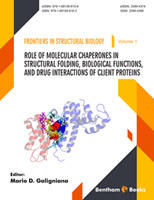 In this book entitled Role of molecular chaperones on structural folding, biological functions and drug interactions of client proteins, several aspects of the biology of these key proteins have been addressed with the purpose of providing an updated overview of the field. The major aim is to present a broad spectrum of the molecular mechanisms of action of several molecular chaperones. Understanding these mechanisms will permit to focus on the design of small molecules able to regulate such functions in the complex cellular milieu affecting the proteostasis network in diseases characterized by aberrant protein folding. Above all, I wish to acknowledge the valuable viewpoint of all contributing authors and hope that this assemblage of perspectives will be a valuable resource for researchers in this and other related fields. Also, I hope that the high enthusiasm showed by all our contributors to make this endeavor possible will be appreciated by the readers. Finally, I must express my greatest thanks to the editorial for the encouraging support to face this endeavor. Russian Academy of Sciences, 4 Institutskaya St.